Offering a premium take on the Canadian National Team, 2015 Upper Deck Team Canada Master Collection Hockey is a factory set with a limited print run. Each box includes a full base set, ten autographs, one 22-card memorabilia set and four additional relic cards. 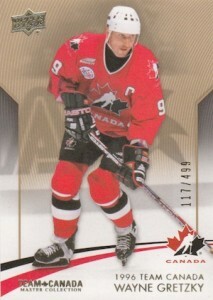 The 50-card base set is included in each box and includes some of the top players of past and present for Team Canada. Silver Spectrum (1/1) base parallels and Silver Spectrum Autographs (#/25 or less) can also be found. A main theme of the entire release, Winning Standard is the primary insert option. 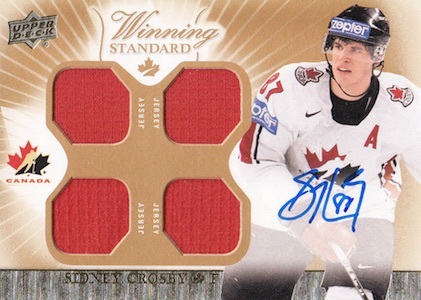 A full set of Winning Standard Jersey cards is found in each set. Additional options under the same banner include Duos, Trios, Quads, Sixes, Patch parallels, Auto Jerseys, Dual-Signed Swatches, Jumbo Patches, Logo Patches, Name Plate Letter Patches, Signatures, Signed Jumbo Patches and Winning Formula. 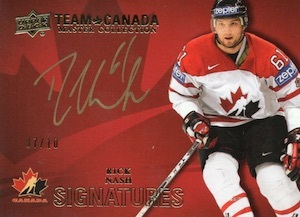 The remainder of the 2015 Upper Deck Team Canada Master Collection Hockey is filled with various autograph inserts. 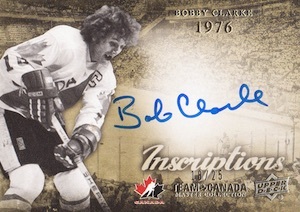 This includes Inscriptions, Luminaries, Program of Excellence Quad Jersey Autos, Program of Excellence Signatures 2, Team Canada Signature Moments Booklets, Team Canada Signature Moments Combos Booklets and several tiers of Team Canada Signatures. The limited release only includes 499 total sets and is exclusive to Canada. Several years in the making, there are no redemptions in the product. 50 cards. Serial numbered #/499. 6 cards. Serial numbered #/99. 19 cards. Serial numbered #/25. 5 cards. Serial numbered #/10. 12 cards. Serial numbered #/15. 8 cards. Serial numbered #/6. 5 cards. Serial numbered #/5. 22 cards. 1 base set per box. 11 cards. Serial numbered #/15. 6 cards. Serial numbered #/8. 4 cards. Serial numbered #/5. 3 cards. Serial numbered #/10. 14 cards. Serial numbered #/25. The price point is $3000 a set. Way too much for what you get in a box. How can I rate this collection, if not 5? It’s a masterpiece of UD with it’s wooden box and the design of the cards. 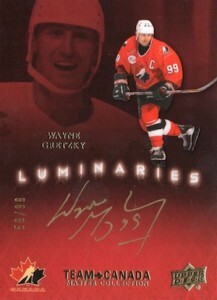 I love the Luminaries autos. Simply amazing. Pulling a booklet of Gretzky (# /25) with signatures on both sides (on the cover and inside) helped me take the decision easily. I also pulled an Orr (auto # /15) and many other good signatures. At the same time, this product is clearly addressed to collectors, not to resellers. I got lucky with my Gretzky. If there were another player in there and not him, I would have lost big money. But this is a thumb rule for High End products. They’re always a hit or miss kind of situation. The only thing that bothers me a bit is the checklist. There are some names in there that shouldn’t be in a 3000$ box. With all due respect for Q. Howden, you cannot put a player with 34 games and 6 points in the NHL, with no Olympics medal and no golden medal what so ever in this kind of product. Jeff Skinner neither should have been there if you asked me. I’m pretty sure UD could have found other players. 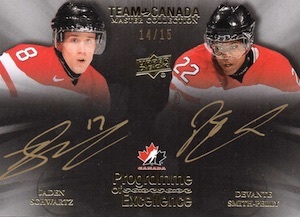 And a question: Does anyone know if for the Team Canada Signature Booklets the players had to sign on the cover AND in the booklet? 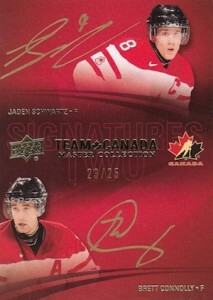 Gretzky signed it on both sides, while Skinner (the other booklet I pulled) signed only inside. waaaaay overpriced! 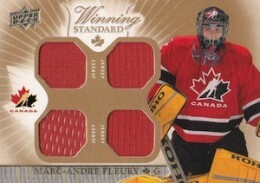 why not put one rare Exquisite Canada Patch and Cup Patch per set? nothing innovative here, just pricey and redundant.